Patek Philippe not only surprised us by introducing white dial versions of the Nautilus collection, they also made us gaze at this other white dialed watch. 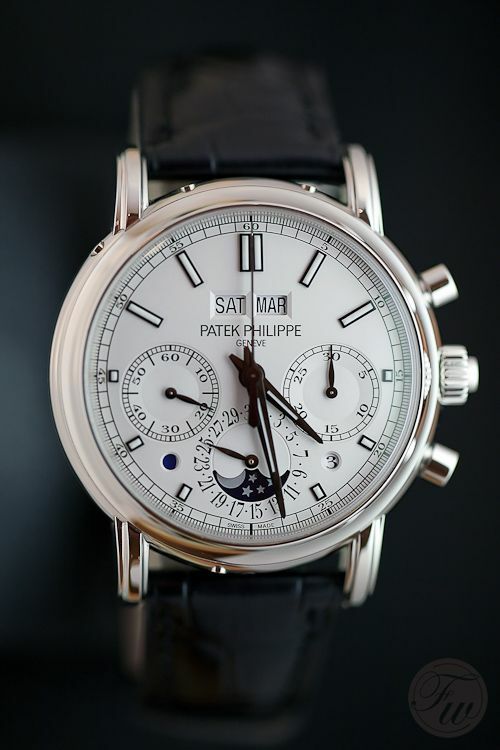 The Patek Philippe Grand Complication 5402P, a split seconds and perpetual calendar in platinum. The 5402P is the successor of the 5004P, a rattrapante chronograph with perpetual calendar in a 36.7mm case, also available in other case materials than platinum. Not only the dimensions of the watch case and the dial lay-out changed, Patek also did some innovations regarding the rattrapante mechanism. A number of technical measurements (a.o. a new isolator system and a new split-seconds lever) improved the reliability of the split seconds chronograph mechanism. A detailed description of these technical improvements can be found here, documented by Patek Philippe. Patek Philippe filed patent for their new split-seconds lever. The diameter of the 5402P increased to 40mm, which makes it a more up-to-date wearable watch then its predecessor, although we have a hunch that the actual buyers of these watches would also settle for smaller diameters. With Patek, it is not about size or getting noticed, it is all about the watch itself. To be honest, 40mm is still below average compared to other complicated timepieces. This Patek 5402P has a wonderful in-house developed and produced hand wound movement inside, caliber CHR 29-535 PS Q. The sapphire case back of this platinum timepiece clearly demonstrates the high level finish and craftsmanship. The bridge of the balance wheel shows the Patek Philippe seal. 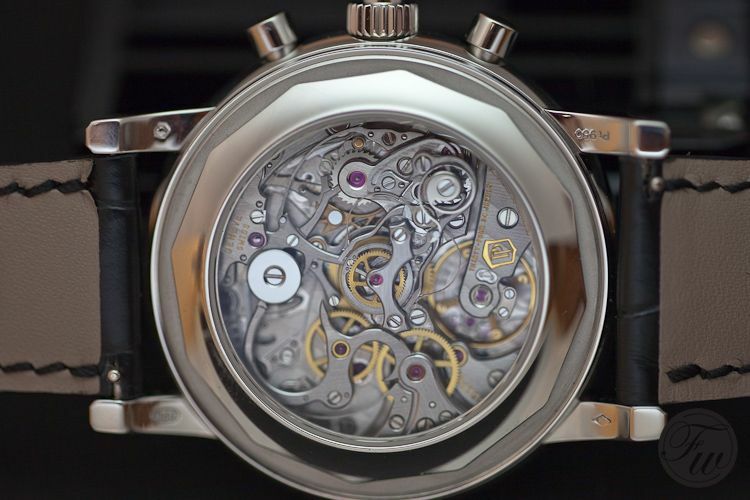 The movement has a diameter of 32mm and consists of 496 parts. Although beautiful, the 5402P has a busy looking dial, having to indicate (besides hh:mm:ss) the day, date, month, leap year, day/night and of course the moon phases. The silvery opaline dial with white gold applied hour markers is a stunner though. 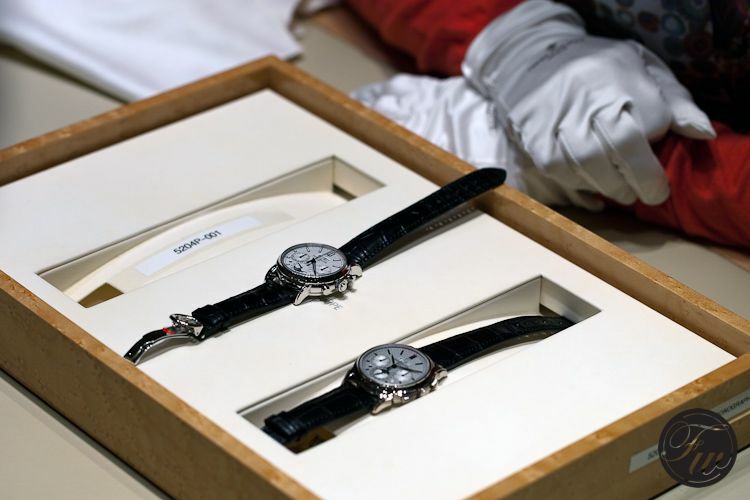 We wonder whether someone is actually going to wear such a beautiful and expensive watch (having a price tag of 260.000 CHF, including VAT), or merely keeps it as an investment and bombs it to a safe-queen. Above in the Patek Philippe booth during BaselWorld 2012, the Patek 5204P next to last year’s introduced Grand Complication, the ref. 5270. 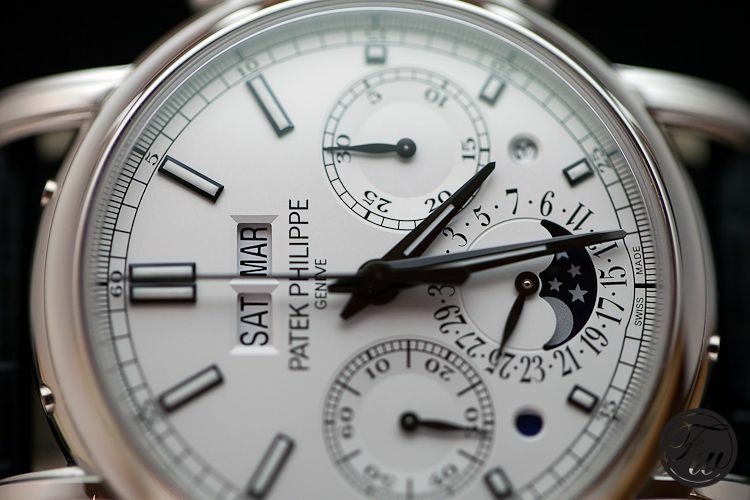 The official page on the Patek Philippe Grand Complication Ref.5204P can be found here.